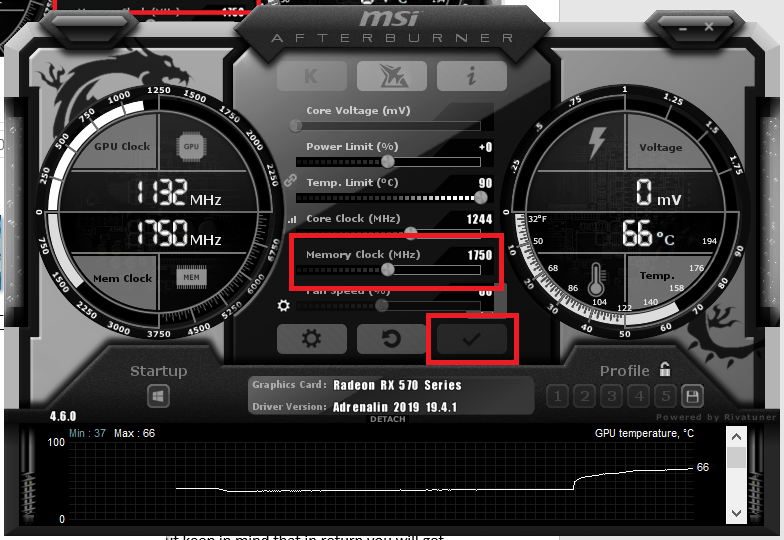 Home / How To / How to Overclock Graphics Card? Sooner or later you will notice that your brand-new PC is not so fast anymore, unless you upgrade your rig every year or two. Graphics in new games advance with every release and suddenly you realize that it is getting quite hard to hit the 60 FPS on ultra or high settings. Sure, you can go and buy new flagship graphics card any time but what if your budget does not allow spending 4 figures on new GPU? Well, there are two options: suffer in silence or try to overclock the graphics card. Be realistic. Your crappy GTX 660 Ti (or whatever relic you are using) won’t turn into RTX 2080 Ti after bumping up some core or memory clocks. Have a proper expectation from GPU overclocking. You will get from 5 to 10 FPS more at best. In the worst scenario, you will get nothing but more heat. Every GPU is different. Even if your friend has the same GPU model from the same OEM, it does not mean you will get the same results when overclocking. You may easily add 300 MHz to the core without any issues and, at the same time, your friend may get BSOD even with +150 Mhz. Graphics card overclocking procedure is the same for all, but results are almost every time are different. Consider heat increase. Overclocking increases the amount of voltage your GPU needs to keep selected clocks. This, in turn, increases the amount of heat it produces. Usually, temperatures increase dramatically with every MHz you apply to the core. If your graphics card has no beefy radiator and fans, do not try to set world’s record of graphics card overclocking. Consider your PSU limitations. 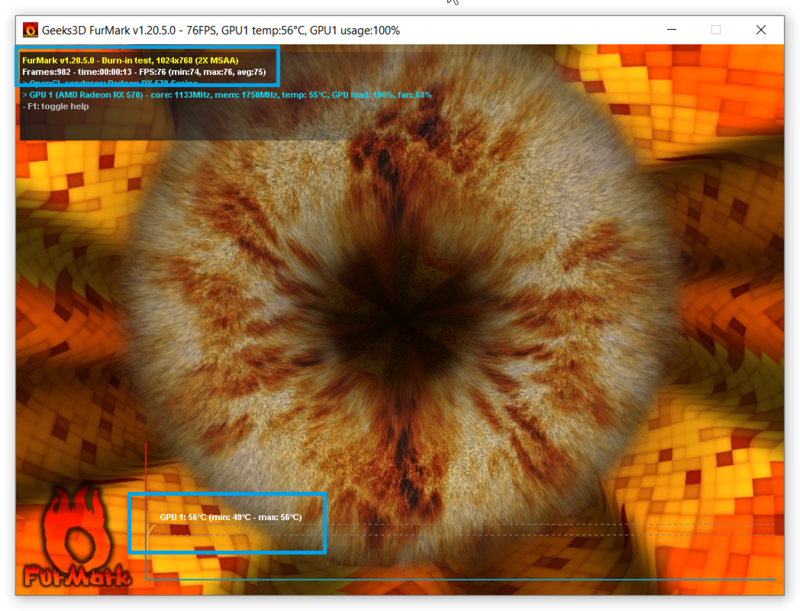 Heat is not the only thing that increases drastically when you overclock graphics card. GPU needs more power to operate on higher clocks thus it drains more juice from the power supply when you overclock it. If your PSU barely meets GPU manufacturer recommendations, you may hit the limit and get an unexpected shutdown, system lockdown or BSOD when overclocking. Consider other PC parts. GPU is not the only thing that may be not enough to provide you with comfortable 60 FPS on graphics settings you prefer. Sometimes users do not realize that CPU and RAM also influence the amount of FPS they get. Perhaps it is better to overclock not a graphics card but a processor or memory. How do you know that? Here is a rule of the thumb: reduce the screen resolution in your game. Lower it from 1080p (or whatever you use) to something like 720p or even less. Alternatively, reduce the graphics settings to the lowest possible. After this, you should get a much higher FPS. Are you getting the same result? That is the sign that your GPU is bottlenecked by a slow CPU or RAM. Overclock them instead. Safety and warranty. Don’t worry, your PC won’t blow up after you add few more MHz to core or memory. Also, this does not void your warranty unless you crack open GPU. Every graphics card has built-in overclocking potential even if it is something really cheap or old. Be patient. Overclocking is a free performance boost for everyone. It does not require you to pay for more FPS. Instead, it requires to pay with your time and efforts. Don’t rush. Take your time and be patient. If you do everything slowly and carefully, you will end up with a better computer, which is capable of running your favorite games with a bit higher FPS. Fails are expected. To be honest, lockdowns, BSOD and other weird things you will encounter are not your enemies but your friends. They show you that you hit the limit of graphics card overclocking and can’t go any higher. Expect to see glitches in games, graphics corruptions, system lockdowns, etc. When you do, just restart your PC and make the overclocking settings lower. Enough talk lets overclock some GPUs. A good thing about graphics card overclocking is that it is simple. It’s not rocketscience and the overclocking utility is very easy to understand. It is called MSI Afterburner. You can download this app on the official website for free. There is one more app you need. It is called Furmark. 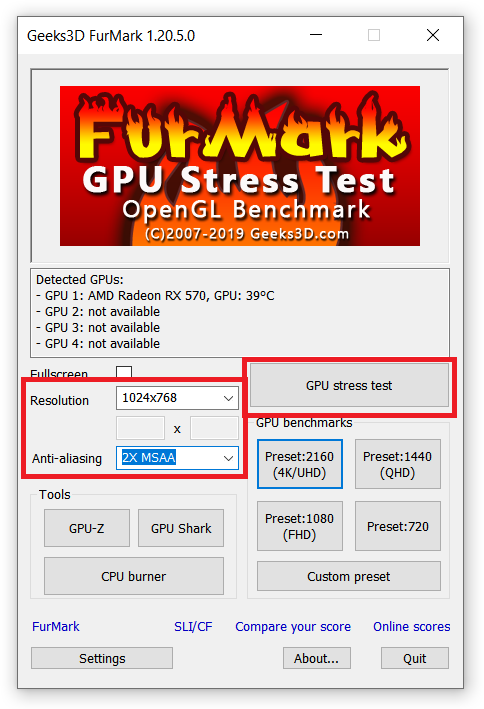 Furmark is a benchmark software which can stress-test your GPU and show temperatures/fan speed/core and memory clocks and other important things. Furmark is convenient because it allows you to see the result of overclocking right away without the need to switch between the apps. Again, you can download Furmark for free from the official website. 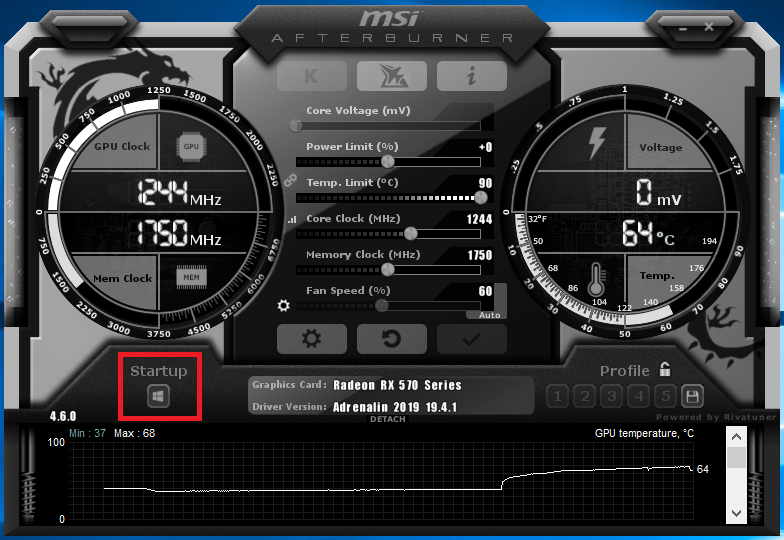 For your information: you can use MSI Afterburner to overclock Nvidia and AMD GPUs. AMD users have one additional option called AMD WattMan which is a part of the driver but in this manual, we will focus on a bit more simple and universal solution called MSI Afterburner. 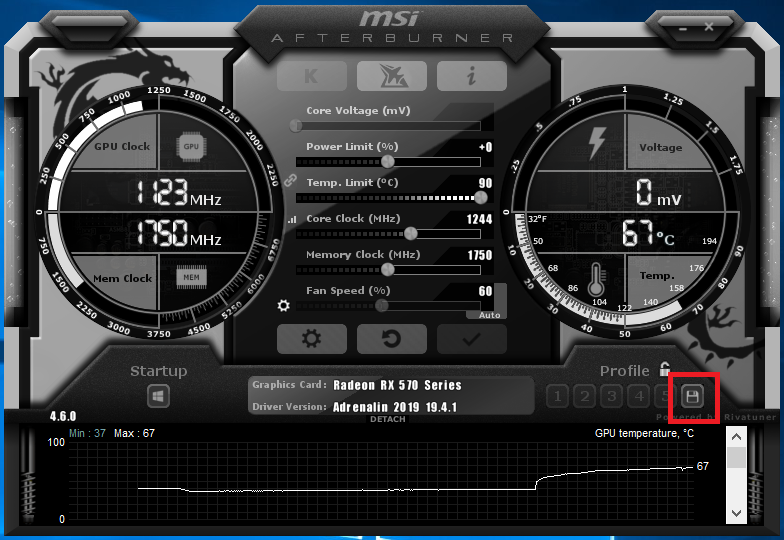 Install and launch MSI Afterburner. Take a look at the central part of the screen with four sliders. These are the only things you need to overclock graphics card. In the big circles at the right and at the left are your core/memory clock and the temperatures/voltage. First, increase Power limit slider to the maximum. Some graphics cards have better overclocking capabilities and allow you to increase the power limit higher than other. Crank it up to the maximum value. Your GPU should have enough juice to operate and not suffocate. Second, set Temp. Limit slider. Each graphics card has its own unique limit. GPU with throttle down its clocks after it hits the temp limit. Google your GPU temperature limitations and set it accordingly to what you found. A universal rule says that it is not recommended to go higher than 75-80 C.
Third, keep Fan Speed % slider at Auto. Let your graphics card handle the cooling for you. 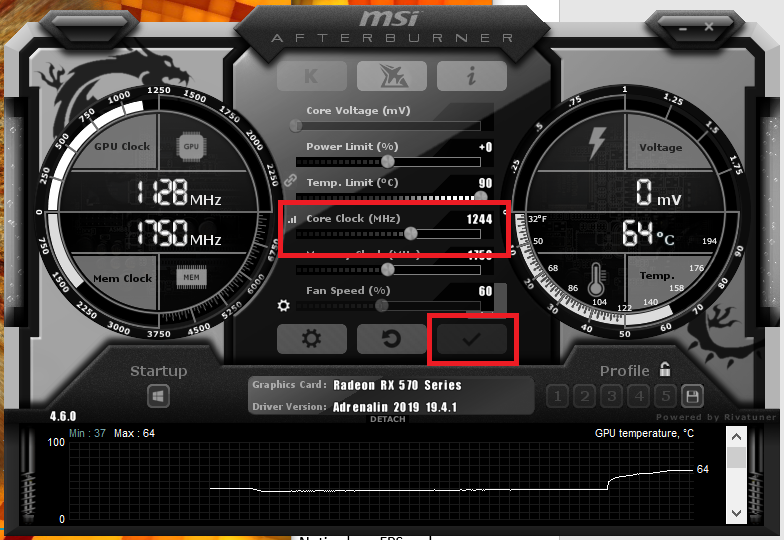 You can change that later to get the proper acoustic level or temperatures according to the overclocking settings. Launch Furmark. In the GPU Benchmarks section select the resolution and MSAA. The higher you set these settings, the less FPS you will get. Press GPU Stress Test. Now your GPU is under 100%. Give it some time to check the maximum temperature with default settings applied. Note the results to compare them later. Keep Furmark running and switch back to the Afterburner. Now it is time to overclock GPU core. Slide Core Clock slider to the right. Set it to something like +50 MHz. Always start with smaller values. Press the button with a big checkmark and switch to the Furmark. Notice how FPS and temperature gages react to the changes. One thing to notice: it is ok to get 1 or 2 FPS more in Furmark. We use this app not to get higher benchmark FPS but rather to see where the verge of overclocking is. In the games overclocking boost will be higher if there is nothing bottlenecking your GPU. Give your card a few minutes to work under the load. Make sure everything is stable and works fine. If so, switch back to MSI Afterburner and increase Core clock again. Apply changes. Repeat this procedure until you get too high temperature, BSOD, system lockdown or any signal of instability. Reduce settings back to the stable. After you found the stable Core Clocks, increase Memory Clocks. Move Memory Clock slider to the right until the system crashes or hangs. Save the new settings to one of the profiles. Press the button with a save icon and select one of the slots. If you want to start over, simply press the reset button. Now it is time to test your overclocked graphics card in the games. Although benchmarks stress GPU harder than games, it is possible that your overclocking settings may not work in the real games. If so, reduce overclocking and try again. Keep trying until you hit the sweet spot. If you are ok with the acoustic levels, keep Fan Speed % in the Auto settings. Otherwise, turn off Auto and decrease fan speed % to the comfort level but keep in mind that in return you will get higher temperature. If the temperature is too high, crank up the fan speed to prevent overheating and throttling. 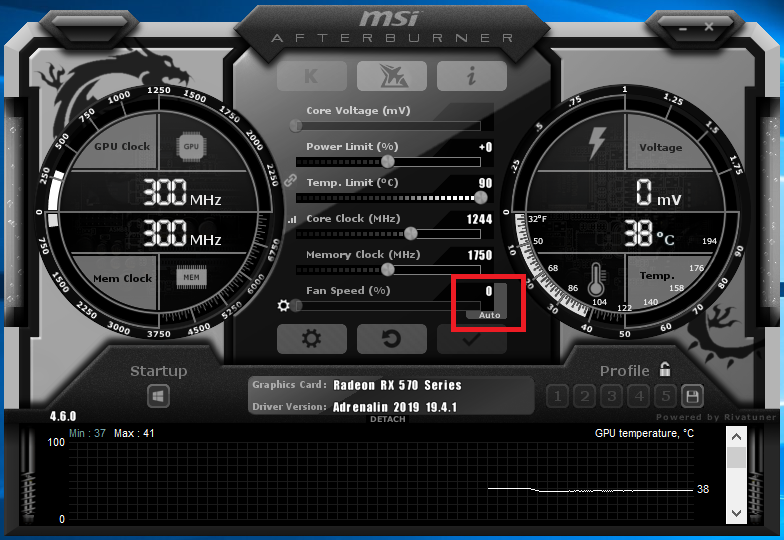 If you want to keep your GPU overclocked constantly, press Startup button. Word of caution here: do this only if you are 100% sure that your overclocking settings are completely stable otherwise you may get a lockdown or BSOD right after the reboot. The only way to fix your system in this situation is to boot your PC in the safe mode and uninstall MSI Afterburner to reset overclocking settings back to stock. How to Overclock Graphics Card in the Laptop? You probably wonder is there any difference between overclocking graphics card in the desktop PC and a laptop. The answer is no, except the fact that laptop cooling is far more limited thus overclocking capabilities may be crippled a bit compared to the regular PC. Also, theoretically you can overclock integrated graphics but, in this scenario, you will get much more benefit from overclocking RAM.